This photograph was published in the Washington Post. 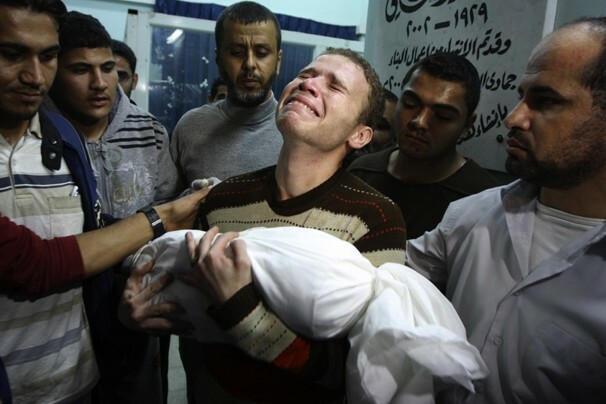 It is a Palestinian man throwing his head back in grief holding his dead 11 month old son Ahmad. This photo created a lot of controversy between countries and the involvement of war. 1. Should this moment be made public? This is a very personal moment that should be kept private. This poor man is traumatized by the death of his son and by publishing the photo it allows everyone to be apart of his life. Not everyone wants to be publicized, especially when it comes to the loss of a loved one. 2. Will being photographed send the subjects into further trauma? The photo taken of the man holding his baby did resault in many having sympothy for this man and his family. But because of the story that followed it did question the allies and the enemies stance in the war. It actually made some circumstances a lot worse and had a rather large impact over the whole event. It could result in more trauma than the man needs. 3. Am I at the least obtrusive distance possible? Publishing this photo with a story that somewhat demeans the actual story and events is not a good idea. You need to keep your distance and your own personal opinions out of the stories and coverage. 4. Am I acting with compassion and sensitivity? The photographer uses an up close shot of the man’s facial expressions. A close shot gives you the ability to see how the person is feeling at that exact moment in time. I feel as if this photographer somewhat shows sensitivity because he is only capturing the man holding his loved on close after the death of his son, but at the same time I don’t think that this photo in particular should be seen by the viewers. It is a personal event in one’s life that should remain within the family.